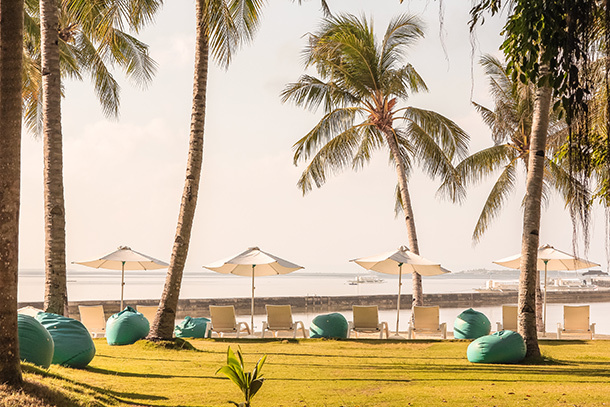 During our anniversary we opted to relax a day or two in one of Cebu’s relaxing destinations: Lapu-Lapu City with its amazing beaches and resorts. Usually, we love to go someplace new, but not this time. We wanted to spend it as a family with our daughter whom we didn’t travelled much with on her first year. We’ve been to Pacific Cebu Resort a few years back with both of our families (with my then-boyfriend). It was where we formally announced our engagement with our families and it was pretty memorable. The resort was one of our best getaway options for our little family. It’s no longer summer here in the Philippines, but the beach is always year-round right? And who can’t resist a day or two basking under the sun and feeling the ocean waves on your skin? Pacific Cebu Resort is also quite spacious with a lot of areas where our daughter can play and run around (which she enjoys lately). 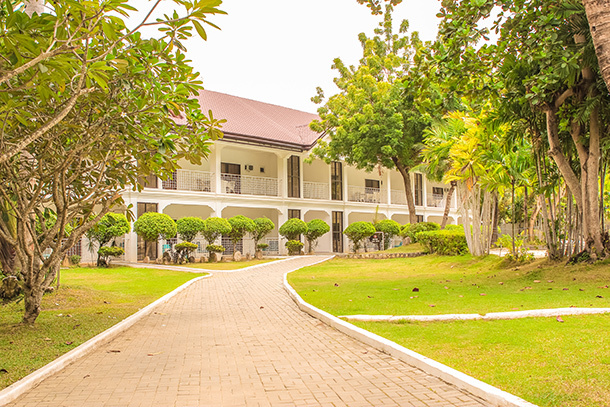 The resort is laid out like that of Crimson Resort and Plantation Bay Resort, but much simpler and less the grandeur. We booked our room through a hotel booking website that I’ve been getting pretty comfortable with. Like most people who don’t want the weekend crowds, we opted to book during weekdays. After putting in our information, we have reserved a room for two days. Convenient and very easy! You may also check out their website and reserve from there. The resort is a bit out of the way and there are no PUJ routes here. You’ll have to hire a tricycle to get here or a taxi. Checking In at the Pacific Cebu Resort was a breeze. We didn’t have a problem at all. I have secured a copy of our booking confirmation from the website beforehand, just in case. 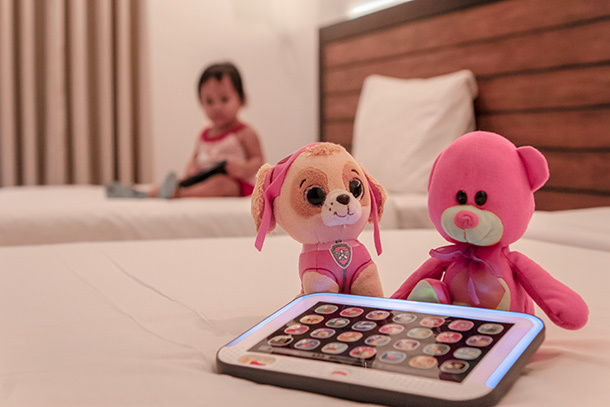 It turned out that we didn’t have to worry about anything as the details was easily gotten from the resort’s system. In no time at all, we were assisted to our room with all our stuff. 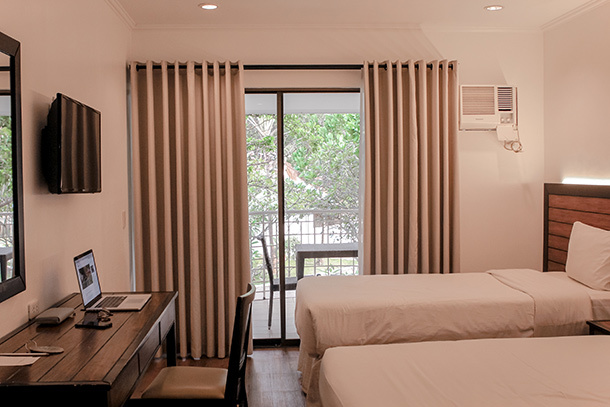 Like most resorts, Pacific Cebu Resort has several room options. 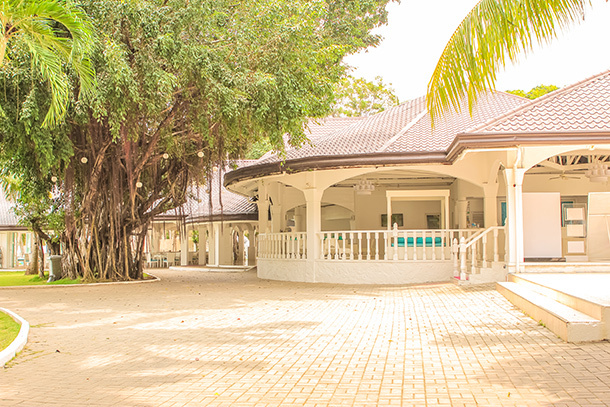 This includes a Standard Room, Deluxe Room and Villas and rates start at around 4,000 Php ++ and already includes breakfast. We got the Deluxe Garden View good for 2 adults and one child for 5,000 Php. The room had two beds, a mini-refrigerator, a flat screen TV and a bathtub. I loved the minimal design. We had a balcony so we got to hang our clothes especially the wet ones after a dip at the pool. Oh and they have free Wi-Fi which was a great thing as it was pretty strong and allowed me to work/blog before going to bed. Now, I know it’s supposed to be a vacation. But I just can’t resist checking out the blog. LOL. What I loved about the resort is that they have 3 pools that you can enjoy plus a private beach if you’re that’s your preference. 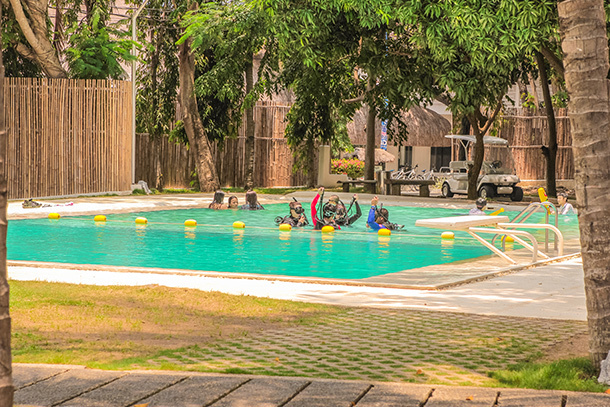 They have the adult pool with lovely views of the ocean, a deep pool where scuba diving lessons are being conducted. The third one is the kiddie pool that my nephew (who were with us before) and my daughter enjoyed during our stay. There are several kiosks and cushions you can use to leave your stuff behind too. The bed near the adult pool was a favourite of ours as it allowed plenty of space for my daughter to crawl and play around. 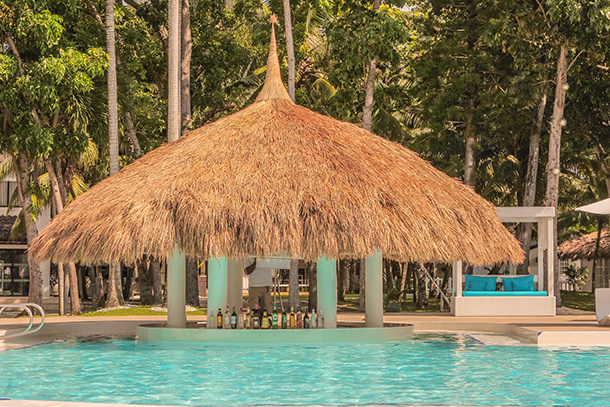 Want some drinks while enjoying the pool? The resort has an in-pool bar for you to order drinks! 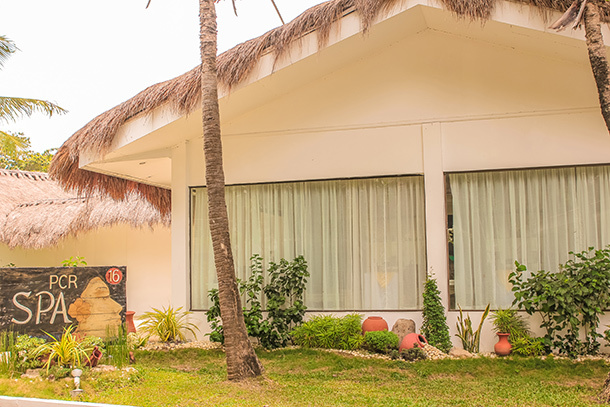 Pacific Cebu Resort’s restaurant is adjacent to their reception area. It’s facing the ocean with wide open walls. They serve their breakfast buffet here as well as lunch and dinner. You can also request to have it served on the patio right next to the sea. We’ve had our dinner there once and it was delightful. One thing that particularly stood out for me was their friendly staff who were very sweet and gave us sweet mangoes during breakfast (shout out to Jorge from the kitchens for being so thoughtful!). My daughter loved them and would prefer them over other dishes and fruits. 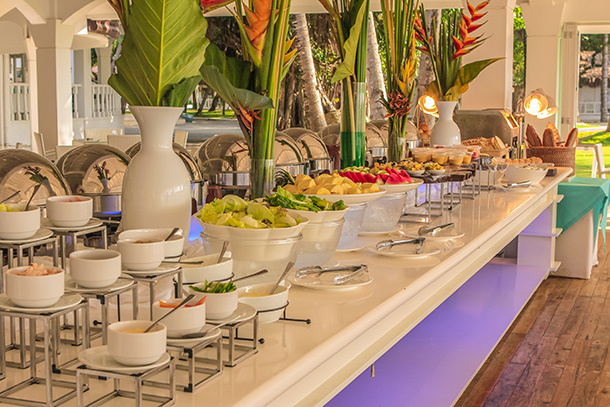 Their breakfast buffet had several meal options with bread, rice, viand, salad and desserts plus omelet. The food they served on their restaurant were a bit expensive but the servings were generous. A Kids Playroom is available but we didn’t got a chance to try it as my daughter was much more happier outdoors. If you need some pampering, the resort’s massage and spa is also available for you! We didn’t have anyone to leave our daughter with, so we did not get a chance to try this though. Left something? Or maybe you want some souvenirs to take home with you? 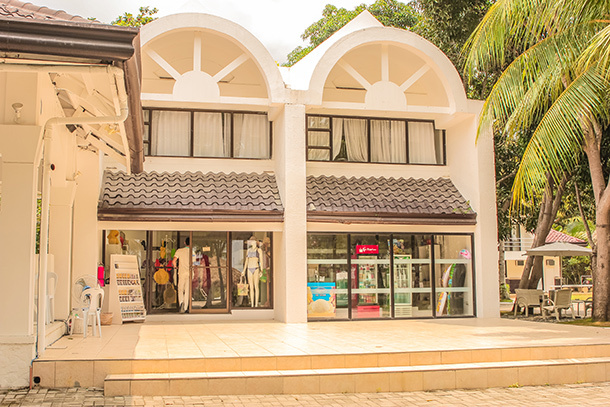 The resort’s gift shop is also open for its guests. 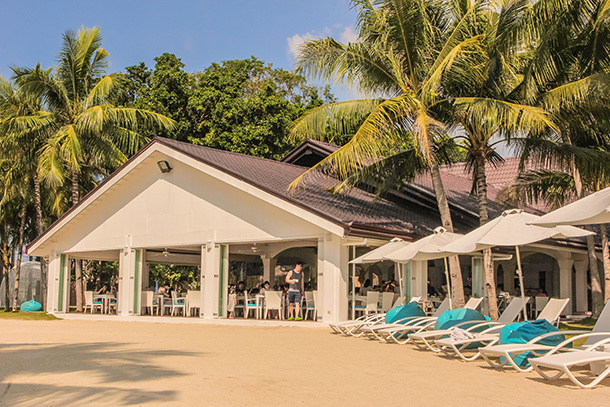 Health and Fitness buffs out there will also love sweating it out at the resort’s gym and it’s tennis and basketball courts! 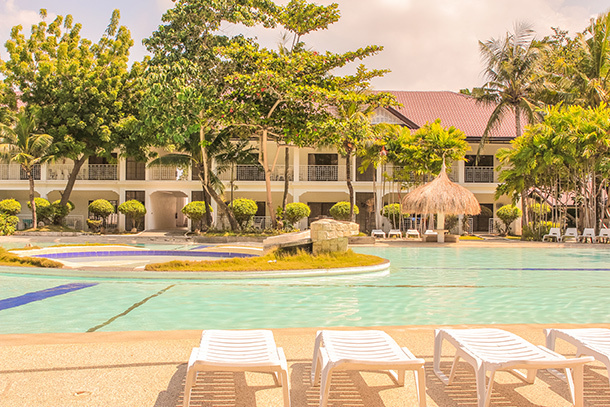 Aside from the amenities, Pacific Cebu Resort offers fun-filled activities for their guests, with applicable fees. This includes a Sunset Cruise buffet, a Rainy Cocktail Party, and a Friday Madness Pool Party among others. You may check it at the reception area for more details. In the afternoon or during sunrise, take a stroll at the riffraff at the edge of the resorts’s property. We spent a few minutes here in the afternoon, just before sunset and enjoyed the quiet and the views. On our third day, we checked out at around 12PM. It started to rain as we were waiting for our turn at the reception though so my daughter did not get to run around the last time before we went home. We stayed for 3 days and 2 nights at the resort and had a relaxing staycation. 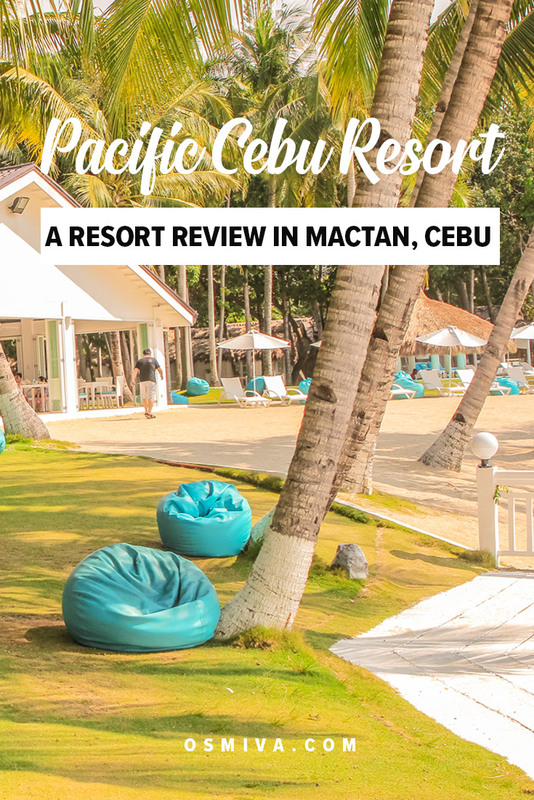 Have you been to the Pacific Cebu Resort? If you haven’t, would you love to? Share your thoughts with us on the comments below! A Sunset Cruise buffet and a Rainy Cocktail Party sounds like out type of place 🙂 Looks like you guys had fun!! Looks like a good place to relax!! Would defo love to stay in this resort when I get to Cebu. Great to see you guys having fun. Have taken a note of this resort for future reference. Really great post! I love the map and the amount of pictures. This is really helpful in deciding whether to book at the Cebu Pacific Resort! Thank you! You’re welcome! Thanks for dropping by Julie! It looks so beautiful there. I’m definitely adding it to my list. Wow! 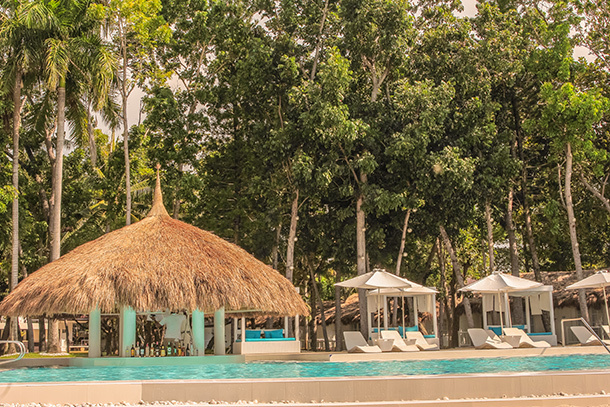 5000 Php is a great price for such a nice resort! Was the breakfast buffet included? I would love checking out each of the pools and the beach, too. Nice that there’s good wi-fi as well…although I guess we should all be better about unplugging on vacation. Looks like a beautiful place to spend your anniversary. It’s so nice that even though summer is over you can still enjoy the beach. How lovely to go back to the place where you formally announced your engagement, and so it has special memories for you. The rooms look really nice, and a reasonable price and I love the look of the pools and resort grounds. 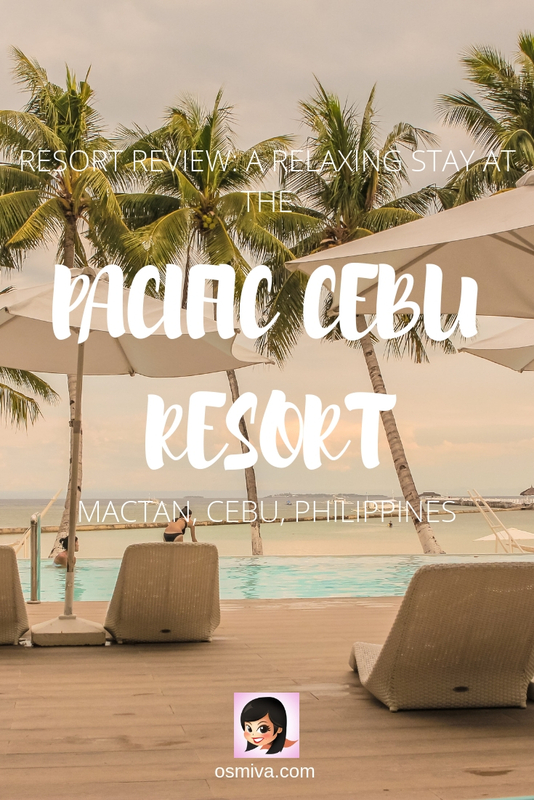 Pacific Cebu Resort looks like a comfortable spot for a vacation by the beach. The pool area looks lovely and rates seem pretty good. If you compared this to some places in the Dominican Republic you wouldn’t be able to tell the difference. 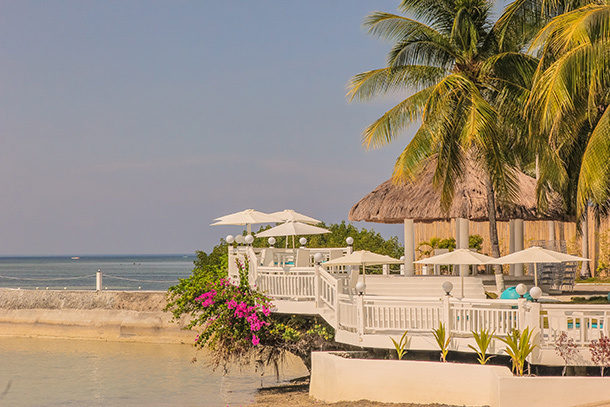 The Cebu Resort looks like paradise unveiled. I like the way it seems so seamlessly integrated with the environment. Also visiting again with the kid must have been quite a unique experience. This sounds like such a great retreat for a family vacation. 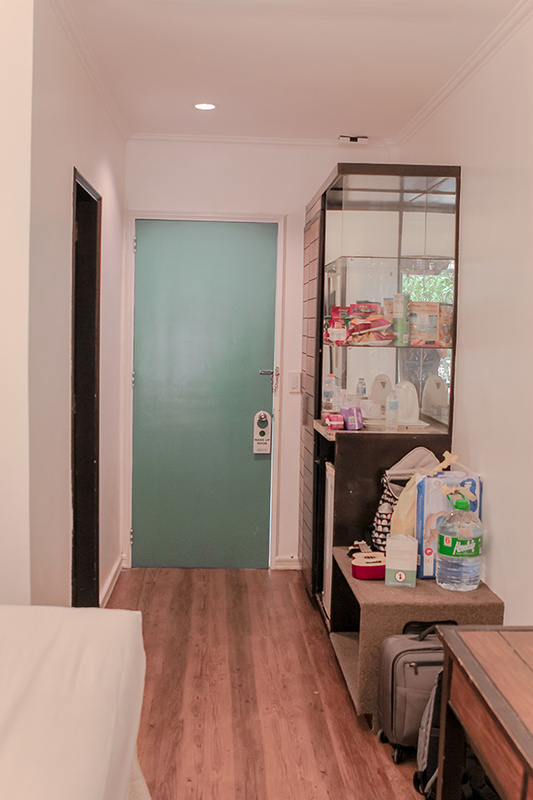 I remember that travelling with small children, you focus on different things and need different facilities and this place seems to have it all. Also, with the little ones, it’s easier to stay at the pool than close to the ocean, so it’s good that they grant this option, too. Looks like a fantastic getaway! Pacific Cebu Resort’s swimming pool and the spa would be the places I’d love to spend the maximum time at. Also, the beachside restaurant. I’m slightly disappointed with the beach though, I would’ve expected a fantastic sandy beach with gorgeous waters in a place like Cebu! Comfortable and nice is the first thing that come to my mind. Add to that the location by the beach. And that fabulous pool and the breakfast spread. This place is perfect for that wind down by the beach. 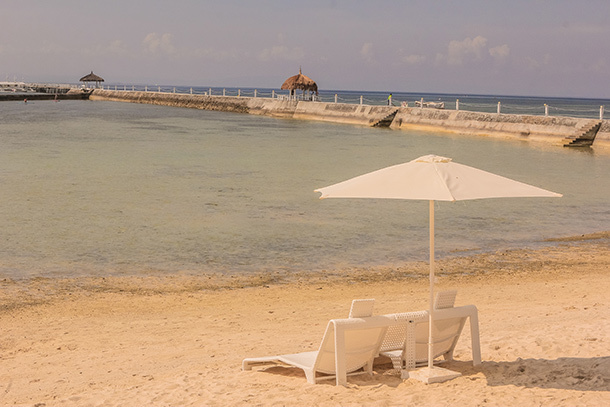 Everything looks like a dream vacation. Relaxing in paradise!